It's worth paying attention to the movements & gestures of Jesus. What He does is as significant as what He says. His actions speak. At the beginning of Matthew 5 leading into the Sermon on the Mount Jesus goes up on to the hill, sits down and gathers the disciples to himself. Then He begins to speak. The hill or mountain is the sacred place where God reveals Himself; the seated position for teaching ("ex cathedra") signifies that the teaching is of central importance; the gathering of the disciples around Him indicates that they have been called out of the crowd for a particular relationship of intimacy with Jesus who is the centre of their attention, their lives. A similar movement takes place at the beginning of John 6 where Jesus presents himself as the new Passover, bread for the hunger of humanity. 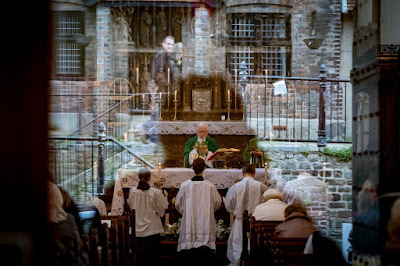 The miracle of the loaves and fish, the rejection of earthly power, the escape to the solitude of the hills, the waling on water are all part of the mystery of Eucharist. The teaching that follows these events is provocative, demanding an unambiguous response, pushes us to a moment of decision. We cannot be indifferent. "The bread that I shall give is my flesh for the life of the world...I AM the bread of life..." The response of many was to say that this is intolerable language, who could ever accept it? An most of the disciples left him at that stage. "What about you" he asked the twelve "will you go away too?" Where do I stand, with whom do I stand? But before the time of decision there is the attentiveness of Jesus to the approaching crowd. He is immediately aware of their hunger, ready to do something about it. He is alert, aware, listening. He who dwells in the deep silence of the Father listens as the Father listens, is attentive as the Father is attentive. Through the immediate physical hunger He intends to feed the deeper hunger of the human heart. A lovely line, an encouraging thought is that Jesus himself knew exactly what He was going to do about this great hunger. But He also wants us, the disciples to participate in His response. He draws Philip out, makes him think about what can be done. 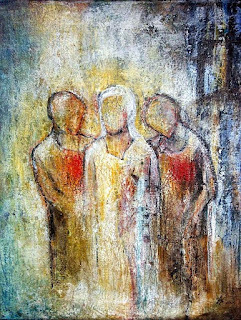 We as Church, as individuals are called to enter with Him into the profound silence of the Father, to hear the hunger of the people as God hears it. To listen to the cry of others, to listen without prejudice and without any agenda of our own. It is a call to universal listening, to be universal as He is universal and that includes listening to what and I do not want to hear. It is an attentive listening that does not exclude. On a personal level Jesus is alert to the hunger that is in me, in each of us. The question is - am I alert to the hunger that is in me? What is the hunger that is masked by my addictions - the obvious addictions and the more subtle ones. I am called to allow myself to taste and feel my deepest desires, to acknowledge them to God and to myself as a first step towards dealing with them in a life-giving way. It means I have to live in the depths of my own being and not simply continue drifting along the surface of my own reality. To live a real life that is offered to God in the Eucharist, to live a life that is capable of being disturbed, unsettled and ultimately transformed. There's a small boy with five barley loaves and two fish. Jesus and Andrew have two different responses to this. Andrew says what is humanly obvious - "but what is that among so many". We ourselves may think that we do not have what is necessary to deal with our life's hunger, that what we have is clearly not enough. But the response of Jesus is to take these little, inadequate offerings and to find in them reasons for gratitude. He gives thanks and somehow the power of gratitude makes the miracle happen. There is enough, even more than enough. An aspect of our Eucharist is to allow the inadequacy of our lives to be taken by Jesus, to be held by Him, to be empowered by His gratitude. We need to surrender our lives into His hands. This is not a lifeless, timid surrender, a simple giving up or resignation. It is a surrender born out of struggle, it is the fruit of an honest wrestling with God and myself, wrestling with my deepest desire. And out of all this comes the abundance that is more than enough. Jesus himself is the food for my desire, the abundance for which I yearn. There's an interesting translation of this passage in which Jesus tells the disciples to gather up what's left over. Most translations talk about gathering up the scraps but this has Jesus telling them to gather up "the broken bits". The broken bits of our lives are collected and saved, saved for another day, another feeding. They are the reserved sacrament by which others will be fed, blessed and saved. i love that image eamonn of the broken bits of ourselves being used for the blessing of others. Amen.